Ferdinand Magellan sailed to the west in hopes of finding a new route to the Island of Malacca. For us Filipinos, we know that in that journey – he actually stumbled upon a couple of islands which is part of what is now known as the Philippine Archipelago. The Philippines was not the Spice Islands that the Spanish Empire hoped for and yet – they came back and occupied the Islands for close to 300 years. 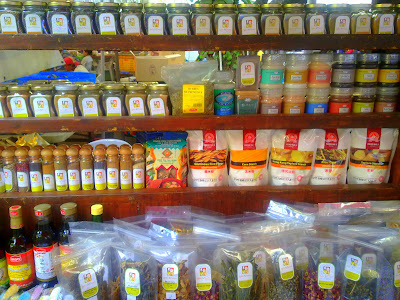 Definitely – the search for the spices had a profound effect to the citizens of this country. To this day, I continue to be amazed at how spices – and the old world’s obsession with them contributed greatly to the shaping of the world’s history. Now – these materials are no longer worth their weight in gold. Spain, the Philippines, and almost every country has access to the once rare and precious spices. In fact, you can grow most of those spices in your own backyard if you choose to. For those of us who do not have a green thumb – the neighborhood grocery store carries each and every item you can think of. I wonder what it was like to live in a world where one cannot afford to buy spices. All I can say is – whoever broke the “code” and was able to “smuggle” the spices out of Malacca and grow them elsewhere – Thank you. Thank you for spicing up our lives.